Preheat the oven to 425°. Spread the pumpkin seeds in a pie plate and toast in the oven for 3 to 4 minutes, or until lightly browned. Transfer to a plate and let cool. Leave the oven on. Spread the squash on 3 large rimmed baking sheets. Drizzle 1 tablespoon of olive oil over the squash on each sheet, season with salt and pepper, toss to coat and bake the squash for 40 minutes, or until just tender and lightly browned; rotate the baking sheets for even browning. Meanwhile, in a large skillet, heat the remaining 3 tablespoons of olive oil. Add the garlic and onions and cook over moderately high heat until sizzling, about 3 minutes. Season with salt and pepper, reduce the heat to moderate and cook, stirring occasionally, until the onions are very soft, about 15 minutes. Add the scallions and cook, stirring occasionally, until browned, about 12 minutes. Add the cumin, paprika and cinnamon and cook, stirring, until fragrant, about 4 minutes. Add the tomatoes and their juices and simmer for 1 minute. Season with salt. Spoon the sauce over the squash and toss gently. In a small bowl, blend the sour cream with the milk, cilantro and lime juice and season with salt and pepper. 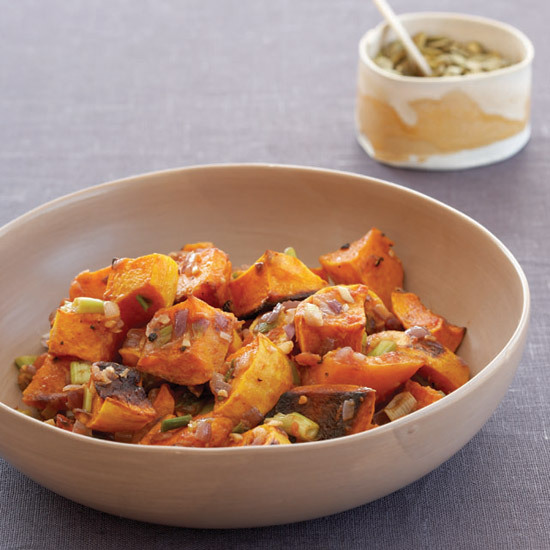 Drizzle the cilantro cream over the roasted squash, sprinkle with the pumpkin seeds and serve. The squash and cilantro cream can be refrigerated separately overnight. The toasted pumpkin seeds can be stored in an airtight container. Bring the squash to room temperature and transfer to 2 oiled baking dishes. Reheat in a 350° oven.